Seattle — The Institute for Protein Design (IPD) at UW Medicine in Seattle has been awarded $11.3 million from the Open Philanthropy Project to support the institute’s technological revolution in protein design and support its work on the development of a universal flu vaccine. One of Open Philanthropy Project’s largest awards in the sciences to date. Its first scientific gift in the Seattle area. Its first investment at UW Medicine. $5.7 million for the institute’s program to develop a universal flu vaccine. Proteins are the workhorses of all living creatures, fulfilling the instructions of DNA. Existing proteins are the products of billions of years of evolution and carry out all the important functions in our body—digesting food, building tissue, transporting oxygen through the bloodstream, dividing cells, firing neurons, and powering muscles. “This gift is speeding up a technological revolution in how we design proteins. Our team can now custom design proteins from scratch, creating entirely novel molecules that can be used for new treatments, new diagnostics and new biomaterials. The Open Philanthropy Project’s generous gift will transform our ability to design proteins from scratch,” said David Baker, the institute’s director as well as professor of biochemistry at the University of Washington School of Medicine and Howard Hughes Medical Institute investigator. Baker is the Henrietta and Aubrey Davis Endowed Professor in Biochemistry. The gift will accelerate the institute’s efforts to advance protein design on computers with the Rosetta software originally developed in Baker’s lab. Baker said the gift will transform’s the institute’s ability to design proteins on computers, test them by creating the actual proteins in the lab, and then repeat the process at an enormous scale. “By speeding up this cycle of design, building and testing, we will be able to systematically improve protein design methods,” Baker said. The results and new Rosetta software will be shared with the scientific community through the Rosetta Commons. The Rosetta Commons is a collaboration founded by Baker with almost 100 developers from 23 universities and laboratories who regularly contribute to and share the Rosetta source code, currently over 3 million lines. This project is in collaboration with Frank DiMaio, assistant professor of biochemistry at the University of Washington School of Medicine. Current flu vaccines are intended to protect only against currently circulating strains, requiring the vaccines to be reformulated every year as the virus mutates, and are only partially protective. With Open Philanthropy Project support, Baker and his collaborators, Neil King and David Veesler, both assistant professors of biochemistry at the University of Washington School of Medicine, will be leading an effort to design universal flu vaccine candidates that provide durable protection against multiple virus strains, including strains that have the potential to cause pandemic outbreaks. The vaccine candidates will be based on the self-assembling protein nanoparticle technology Baker and King have developed. To ensure that the vaccine candidates are thoroughly and efficiently tested, they will work in close collaboration with the groups of Dr. Barney Graham and Dr. Masaru Kanekiyo at the Vaccine Research Center of the National Institute of Allergy and Infectious Diseases at the National Institutes of Health. The goal is to design a nanoparticle vaccine that can trigger an effective immune response to many existing flu strains as well as new strains that might appear in the future. Researchers hope such a universal vaccine might need to be administered no more than every five years, ending the need for annual flu vaccinations. 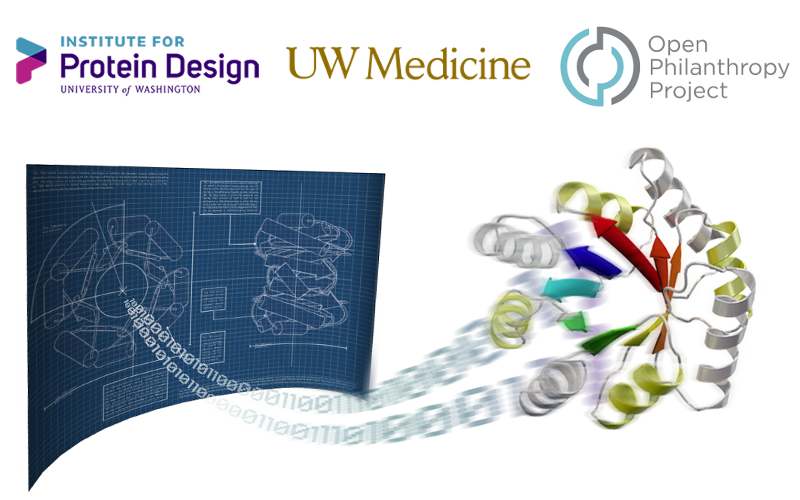 The Institute for Protein Design, founded in 2012 at UW Medicine in Seattle, is a research center that focuses on creating custom-designed proteins to improve human health and address 21st-century challenges in medicine, energy, industry and technology. In the human body, proteins are chains of amino acids directed by genes to perform essential life functions in every cell including in the brain, muscles and internal organs. Proteins also have implications for the design of new materials outside of the human body such as new kinds of fibers. The institute’s team of 120 faculty, staff, postdoctoral fellows and graduate students work on designing entirely novel proteins from scratch to create, for example, new, safer and more potent vaccines and therapeutics to prevent or treat people with serious diseases. The institute has assembled some of the world’s top experts in protein science, computer science, biochemistry and biological structure, pharmacology, immunology and clinical medicine. The Open Philanthropy Project identifies outstanding giving opportunities, makes grants, follows the results, and publishes its findings. Its main funders are Cari Tuna and Dustin Moskovitz, a co-founder of Facebook and Asana. See news in UW Medicine Newsroom. For more information on the IPD check out this video! Thank you to our supporters. GIVING IN ACTION: Making Dreams Come True. Bruce and Jeannie Nordstrom, and Three Dreamers all supporting the IPD. Thank you all for your help in supporting our efforts in protein design.